I concluded the minimalism challenge (originally from into-mind.com) this weekend. The remaining items were the most difficult for me, and I didn’t succeed at all of them. I think what’s important is that I became more aware of my actions and I can work on being more present from now on. No complaint day. I see myself as a positive person, but when I focused on no complaints for a day I realized how difficult it is to not make negative comments about what goes awry throughout the day. My no-complaint day fell on a workday, and last week was particularly frustrating workwise. My VPN connection was extremely slow and my workload was hefty. I tried to make the best of it, but I am not perfect. I let the stress get to me sometimes. I did the best I could to not complain. No TV all day, read instead. I have tried to do this task several times this month. One recent Saturday I went without TV until late that evening when Graham came home from work. On another day, this time a workday, I made it most of the day. Leave a whole day unplanned. I left a weekend day unplanned, which has been rare this summer. I tend to keep a list of not only errands to run but also fun stuff to do. What can I say? I’m a planner. It ended up being a lazy Saturday. The rain did nothing to help my motivation to get out of the house. I watched “Ferris Bueller’s Day Off,” which — believe it or not — I have never watched in its entirety. I binged on chips and queso. I searched online for a winter coat and rain boots in anticipation of the W word. Practice single-tasking. This is next to impossible for me when it comes to work. I purposely focused on this on a workday in order to try to avoid stress. I have to constantly remind myself (and others) that I can only do one thing at a time. The most frustrating thing for me is having to stop a project halfway to do something else, which happens frequently at work. I might be editing one report and will have to drop it to edit something for my department’s top manager. I kept an eye on how many browser tabs I kept open and tried to avoid getting distracted on the Web. Stay offline for one day. Fail. I didn’t do this all month. It would have been impossible to do this on a weekday because of work, so I saved this for a weekend. But I completely forgot until I found myself on Twitter, then Blogger, then down the rabbit hole of the Internet. I’ll focus on not being online while I’m out doing things with my friends and family, but let’s face it, the Internet is such a part of our daily lives. I look forward to the next time Graham and I go camping, because that’s really the only time I ever fully disconnect for entire days. Part 1: Unfollow and unfriend; streamline your reading list; turn off notifications; clean out your closet. Part 2: Evaluate your last five purchases; learn to enjoy solitude; go for a walk and practice mindfulness; go bare-faced. 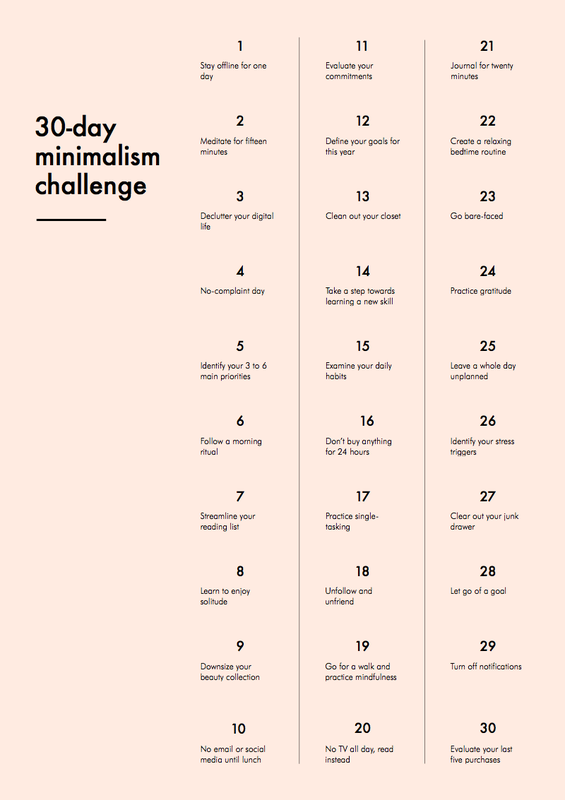 Part 3: Meditate for 15 minutes; no email or social media until lunch; let go of a goal; downsize your beauty collection. Part 4: Journal for 20 minutes; identify 3-6 priorities; follow a morning routine; identify stress triggers. Part 5: Declutter your digital life; define your goals for the year; take a step toward learning a new skill; clear out your junk drawer. Part 6: No purchases for 24 hours; practice gratitude; evaluate your commitments; create a relaxing bedtime routine; examine your daily habits.